When your pipes are sweating and dripping or freezing call us. we insulate pipes. Properly designed and installed fiber glass, rock wool, and slag wool insulation systems immediately reduce the need for energy, a costly ingredient of every product made. Fiber glass, rock wool, and slag wool insulation systems reduce the surface temperature of piping and equipment to a safer level, resulting in increased worker safety and the avoidance of worker downtime due to injury. By reducing heat loss or gain, fiber glass, rock wool, and slag wool insulation can help maintain the process temperature to a pre-determined value. Insulation thickness must be sufficient to limit the heat loss in a dynamic system or limit the temperature drop, with time, in a static system. Specifying sufficient insulation thickness with a good vapor retarder is the most effective means of controlling condensation and limiting corrosion on cold piping, ducts, chillers, and roof drains. Sufficient thickness is needed to keep the outer most surface temperature above the dewpoint temperature of the ambient air. When used in combination with other materials, fiber glass, rock wool, and slag wool insulation help provide fire protection in fire stop systems, grease- and air-duct fireproofing, and electrical and communications conduit and cable protection. 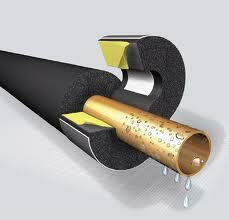 Call us to insulate your pipes.